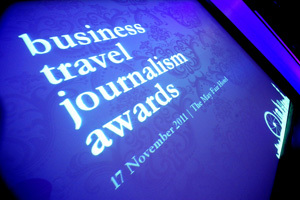 C&IT's editorial team triumphed at last night's CWT Business Travel Journalism Awards 2011, with the magazine shortlisted for and winning two trophies. C&IT art editor Susana de Dios won the award for Business Travel Designer of the Year, for the second year in a row, beating three other shortlisted entrants. Meanwhile, C&IT news editor Magda Ibrahim, and the editorial team, won an award for the May edition's State of the Industry report, picking up the gong for Business Travel Supplement of the Year and again beating competition from three other shortlisted entrants. The awards judges described de Dios's work as "eye-catching", "clever and impressive, with brilliant layout". "The judges were impressed with Susana's ability to make copy and images jump from the page with her clever design work, which augmented the copy rather than overwhelm it," the panel said. "Her professional designs were in context and made the content sing." De Dios said: "It was really amazing to win for the second year in a row, up against such respectable competition." Yasmin Arrigo, C&IT's editor, said: "I am delighted that the team's hard work has been recognised in these much sought-after awards. Susana led C&IT's redesign last year and her contemporary designs are now used across the brand's portfolio, both in design-led print products such as the recent A is for Australia guide and at our live events, including the dynamic C&IT Awards. "The State of the Industry supplement is a complex report to compile and the commendation for Magda and the team is testament to their determination to secure the exclusive interviews and in-depth analysis. Congratulations to all of the team on this fantastic achievement." The awards were organised and promoted by Carlson Wagonlit Travel.